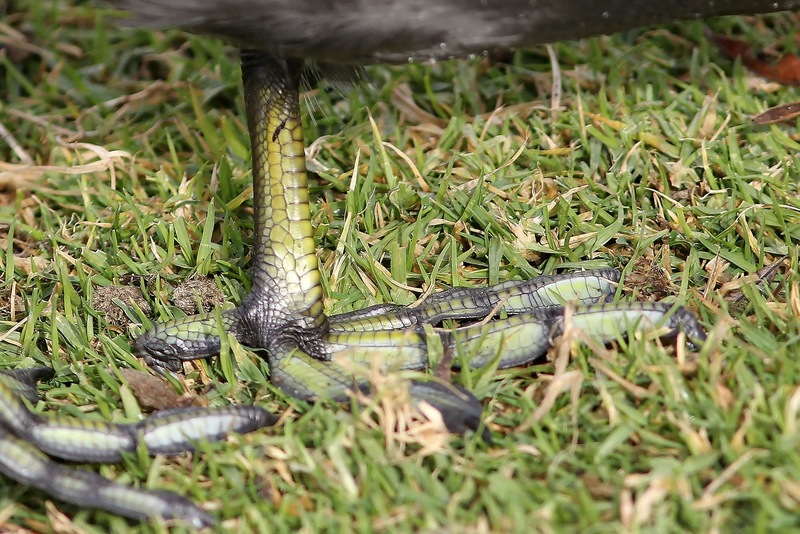 I don't know what it is about American Coot feet - I just think they are very cool. Maybe it is because they are some of the few larger birds whose feet are readily seen? Perhaps if I could inspect other birds feet I'd find that there are plenty of other cool ones? Coots love to leave their aquatic habitat and graze on lawns and golf courses - and hey are fairly tame. As a result, they make for an easy, if bland, photo subject. Before I knew much about birding, I saw a Coot's feet and assumed that they must be camouflaged to allow them to hunt aquatic insects, fish, mussels, or other animals. But it turns out they are primarily vegetarians. When not grazing on grass, they dive for aquatic vegetation. Coots are some of the most common aquatic birds in the US, especially west of the Mississippi. So next time you see a flock tearing up your favorite golf course, take a look at their feet and gain some new respect for them. Oh, and one more note. Take another look at that foot picture. Does the word 'dinosaur' come to mind?